Compare Indoor Home Security Video Cameras: Nest, Canary or Foscam? Remote monitoring of what is happening at home is not a new phenomenon, but the arrival Wi-Fi wireless home video cameras such as Nest, Canary and Foscam highlights the simplicity with which domestic surveillance can nowadays successfully be achieved from wherever you may be. These cameras connect to your Wi-Fi network and stream to the Web whatever is happening back at home, allowing you to watch everything discretely from wherever you may be, using a either a laptop, smartphone or tablet. They can also alert you by sending messages to your smartphone, tablet or laptop when changes are detected so that you can view the live or recorded video and find out what is happening back where the camera is. There are many types of home surveillance cameras available, but most of these are just designed to view what is happening in one room of your home while you're in another room, and they don't allow recording of videos. They are adequate to watch your baby while you are at home, but when you are away from home, they become useless! Few cameras will actually allow you to watch live or recorded videos of your baby from anywhere in the world while providing you with alerts, video privacy, and all the convenience you may need! Nest, Canary and Foscam cameras are definitely some of the best and most popular camera brands available today that provide the above described functionality. This review will compare wireless home video cameras Nest, Canary, Foscam FI9821P and Foscam FI9831P to help you choose the most suitable one for your needs. From your computer, smartphone or tablet, you register to a website associated with your camera. You connect the camera to your home Wi-Fi network (the procedure to do this is very simple and usually detailed in the camera's user manual). The camera will start streaming continuously encrypted video to the Web server associated with your cam over your Wi-Fi network. Motion and sound based alerts are also generated by these cameras and sent usually to your e-mail and smartphone. By accessing the camera's website from a computer using a Web browser (or from a smartphone or tablet), you can watch live video of what is happening back where the camera is. Some cameras equipped with a micro SD card slot can record the videos onto the micro SD card, while others record automatically the videos offsite at the camera's server so that they can be accessed later from anywhere and using any device (desktop computer, laptop, smartphone, or tablet). The videos traveling over the internet are encrypted for security. With all cameras considered here you can watch live video of what is happening back where the camera is by accessing remotely the camera server's website from a smartphone, tablet or PC, using a web browser or the associated free app. All cameras considered here use infrared technology to record video in total darkness. Motion detection for alert generation also works in darkness. With the Nest camera you will receive alerts by e-mail and on your smartphone whenever either motion or sound is detected. You can then proceed to watch live what is happening back where the camera is. 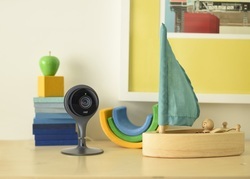 With the Canary camera, when motion is detected, you will receive a notification with recorded HD video of the event, as well as the option to watch live. There is no sound triggered notifications. Note that the algorithm-based motion detection learns and adapts to your home over time so that no false notifications are sent. Basically, the longer you have the camera, the more effective and foolproof the security system becomes. With the Foscam cameras you will get notifications whenever motion is detected (no sound triggered notifications). You can then proceed to watch live what is happening back where the camera is. All the cameras considered have built-in microphones and speakers, but the Foscam cameras are also equipped with an additional external microphone jack. During emergency, using the Canary app, with a swipe of the finger you can sound the 90+ db siren the unit is equipped with. There is also another emergency feature that lets you call local police from anywhere. Nest does not have a built-in recording functionality in the camera itself. But if you subscribe to a DVR plan from Nest, video recording is done automatically and continuously 24/7 on the web server your Nest camera communicates with. The camera streams the video to the server, and the video is recorded there. This is very convenient, as the user can always access the server using a web browser or the Nest app to view recorded video in order to see what happened back home when an alert is received. If you don't subscribe to the DVR plan, you can only watch the live video when you access the server. Note that with the $9.95/month DVR plan, recordings are kept for 7 days and then overwritten. For $29.95/month they are kept for a month. These prices were in effect at time this article was written and may have changed. With Canary, recording starts automatically when motion is detected as long as motion-activated recording is enabled. Both the video and audio are stored in Canary’s cloud storage. There is no required monthly fee for the basic service which gives you access to recorded events from the last 12 hours and up to five bookmarked videos on the Canary cloud. Then you have plans ranging from $5 a month to $30 per month depending on how long you want the videos kept. Note again that these prices were in effect at time this article was written and may have changed. Foscam FI9821P and FI9831P come with built-in recording (DVR) functionality which allows the recording of videos on an SD card (up to 32GB) at no cost. 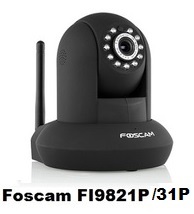 Foscam FI9831P also offers the optional fairly priced cloud recording service. Foscam cloud provides an easy way to automatically back up your recordings to a secure offsite server. The iOS/Android Foscam cloud control app is included in the purchase, so if desired, you can try it absolutely free before subscribing. 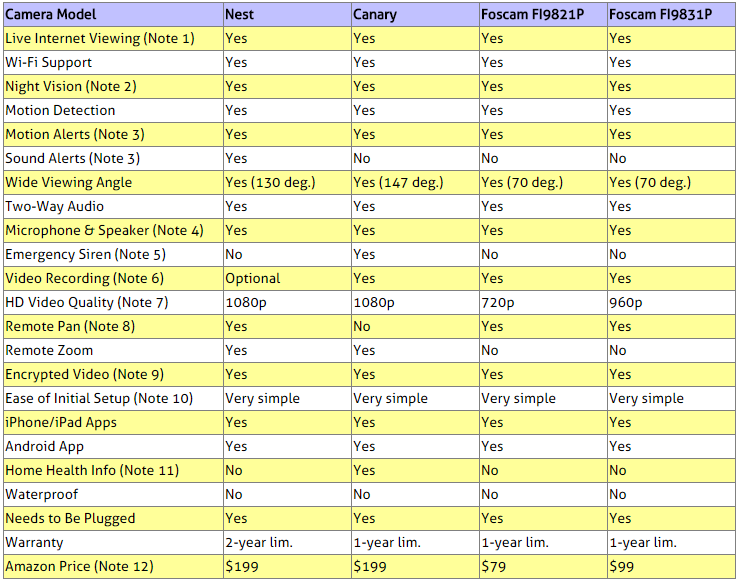 Of the 5 cameras considered here, Nest and Canary, with their 1080p resolution, provide the best HD quality imaging. Canary is a stationary unit, and does not mechanically rotate, pan, or tilt. However, it features a 147 degree wide-angle field of view which covers a large area without the need to pan, and up to 3x digital zoom. All cameras considered here products encrypt videos traveling over the network for security. No complicated installation procedure is required to setup and run the Nest, Canary and Foscam FI9821P cameras. The initial setup is trivial and anyone can do it. You just need to power the camera and then use the associated free iPhone or Android app to create an account with minimal personal info. The app will locate your camera and ask you to select your desired Wi-Fi network and prompt for the password. That’s it! Anyone can do it in a few minutes. Setting up the FI9831P camera is even more trivial: all you need to do is use your phone to scan the QR code on the bottom of the camera. This bypasses the need to access your router and configure port forwarding. So, FI9831P camera can be easily set up by anyone in as little as 60 seconds. Canary monitors air quality, temperature, and humidity. It all adds up to a smarter system and a safer home. The prices shown are Amazon prices that often include a good discount on the list price of products. These prices were in effect when this article was written and may have changed. For exact prices, please click the Amazon product link images in the Amazon section below. If a discount exists, both the list price and the actual Amazon price will be shown. So which of these cameras to buy? If price is an important factor, you might want to consider the Foscam cameras which are the lowest priced of the cameras considered here. Though they do not generate HD quality imaging at the level that the Nest and Canary cameras do and they do not support remote zooming, they are the only ones that provide no-cost and on camera recording on a micro SD card. Note that Foscam FI9831P has better image resolution than Foscam FI9821P and provides a faster and simpler initial setup procedure as described in Note 10 above. Now, if you don't mind paying a bit more, you could also consider a more recent Foscam camera, the Foscam FI9826P which has all the features of Foscam FI9831P, but in addition it supports 3X optical zooming. 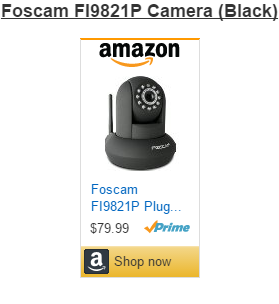 All three Foscam cameras are offered below in the Amazon products section. Those of you who want to get the latest and greatest will have to make a choice between Nest and Canary. Both cameras provide 1080p HD imaging, but they have a couple of differences. Nest generates not just motion based alerts, but sound based alerts as well. It support remote pan and tilt, and has a 2-year warranty as opposed to 1-year for Canary. ​Canary is equipped with an emergency siren that can be activated remotely, monitors air quality, temperature, and humidity, and provides a no-fee basic service which gives you access to recorded events from the last 12 hours, while with Nest , to access recordings you need to subscribe to a DVR plan.​​ Canary also uses algorithm-based motion detection that learns and adapts to your home over time so that no false alerts are sent. Both the Nest and Canary cameras are offered below in the Amazon products section. 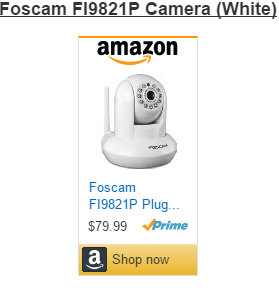 The compared wireless cameras can be bought right here on Amazon. Please click the product of your choice below to see the price or to purchase. Note: Amazon often provides a good discount on the List Price of sold products. If a discount is available, the List Price and the actual Amazon price will be shown when you click the images below.